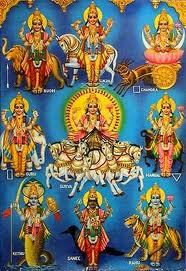 According to Hindu Dharma there are Nine Important Planets which will show their power on a Normal Human beings. Depending on the Astrology and horoscope of the particular person basing on the stars rotation, some rays will fall on the respective person. During that period some planets will give Good Effects and some planets will give Ill Effects due to their nature. This is common to everyone just like commencing Day and Night which you are seeing daily. One who will chant these MANTRAS DAILY all these planets will be in touch with us and gives us good fortune..
May be some typos will be there here..
please listen to this prayer and then continue reading.. So that it will useful to you. Thamo'urim sarva Paapa ganam - Pranathosmi Dhiwaakaram. Foe of darkness and the one who dispells all sins, I prostrate that Soorya. Namaami sasinam Somam - Sambhor makuta Bhooshanam. Kumaaram Sakthi Hasthancha - Mangalam Pranamaam Yaham. One who has Shakthi in his hand, and the auspoicious one, I prostrate that Angaraka. Sowmyam sowmya Gunopetham - Tham Bhudham Pranamaam Yaham. Bhudhdhi bhootham Thrilokesam - Thannamaami Bhruhaspathim. Sarva saasthra Pravruththaaram - Bhaargavam Pranamaam Yaham. and the one who preaches the Shatras, I prostrate that ( Bhargava )Sukracharya. Chaayaa Maarthaanda Sambhootham - Thannamaami Sanaicharam. Simhikaagarba Sambhootham - Tham Raahum Pranamaam Yaham. The one who has half a body and is full of valour, One who opposes Chandra and Surya without fear, One who was born from Simhika's womb, I prostrate that Rahu. Rowdhram rowdhraathmakam go'ram - Tham Kethum Pranamaam Yaham.